My calzone was flat and boring. His was rich, creamy, and full of all kinds of explosive flavor. I ate mine sadly while looking over at his wistfully, probably much in the same way my Pema cat looks at my Lhamo cat as they’re eating their food (which is actually exactly the same). Needless to say, I haven’t made that sad calzone since. Those midwestern folks were onto something. The mozzarella makes the interior creamy and indulgent. The blue cheese gives it some grounding — if you’re hesitant, like I was when I began making it for myself, just use a sprinkling. But paired with the kick of the hot sauce it merely lends some earthiness. 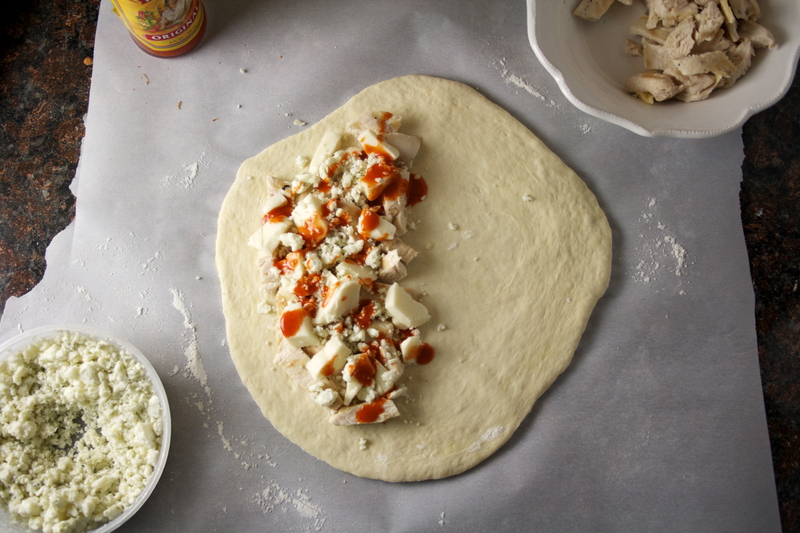 We use Cholula in ours (it’s relatively mild, I think, with a hint of sweetness), but use your favorite. We’re both just a little averse to extreme heat. 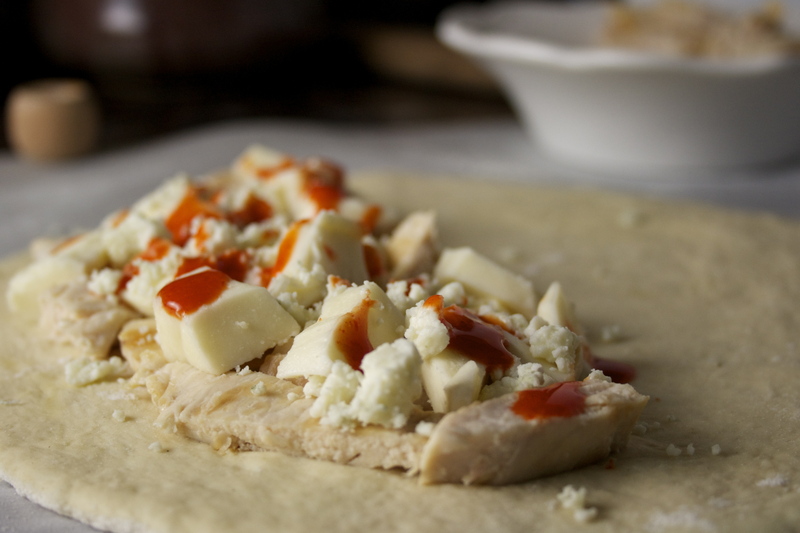 Baked up in a pocket of pizza dough, the combination of cheese and hot sauce bubbles and oozes. The chicken holds its own in there, making it substantial and lending texture. And please, dip it in ranch. It’s an extra layer of indulgence, another layer of flavor. I mean, really, it’s just buttermilk mixed with herbs and spices. 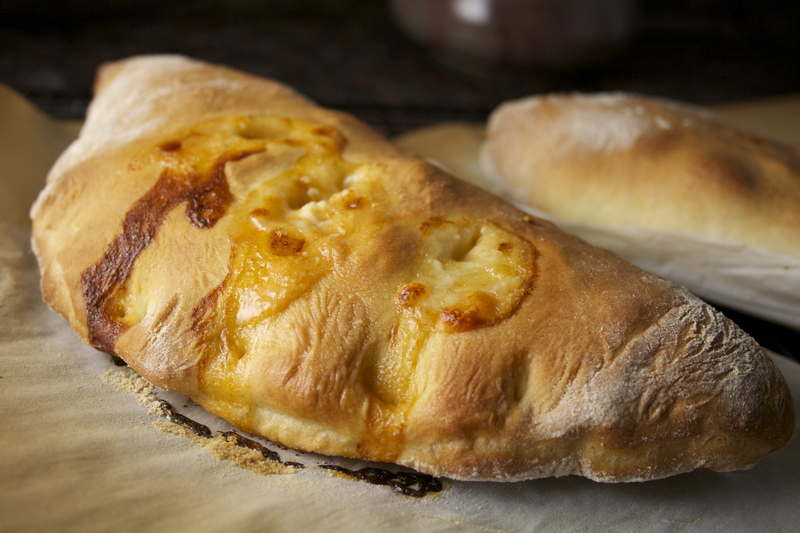 We dip our carrots in it — why not our calzones? Use your favorite pizza dough for this recipe. Mine is the olive oil dough from Artisan Bread in Five Minutes a Day — really easy, no kneading required, makes enough for at least 6 pizzas or calzones, and is incredibly flavorful. For that, you’ll need two orange-sized pieces, about 8 ounces each. Shape the piece quickly into a smooth ball by pulling the dough around on all sides, turning it a quarter-turn as you go. 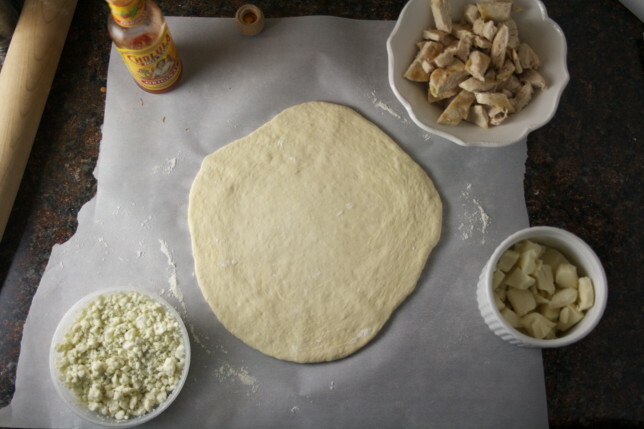 You can also certainly use pizza dough from the supermarket, or from your favorite pizzeria. But it’s pretty awesome to make your own and tout it as the best in (name your city). 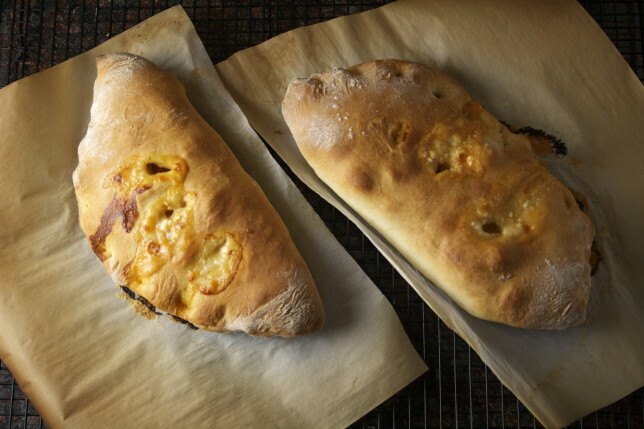 I use a baking stone for my calzones, but you can absolutely bake yours on a baking sheet — they’ll still come out beautifully. The measurements below are meant to be guidelines — feel free to up your blue cheese, etc, if you feel so inclined! Preheat oven to 450 degrees with an oven rack placed in the center, with a baking stone if you have one. Place a second oven rack just beneath, with a broiler tray or a baking pan, for the hot water that you will throw in later (which will create steam and help brown the crust). Do NOT use glass. On a sheet of parchment paper sprinkled with flour, roll 8 ounces of dough into a 9-inch round, about ⅛-inch thick. Use more flour as needed to prevent it from sticking to the rolling pin, and use your hands as necessary to stretch it into shape. Don’t get frustrated if it keeps shrinking back on you — just let it rest for a moment to relax the gluten and try again. Place half the grilled chicken over one half of the round, leaving a 1-inch border at the edge. Place half the mozzarella over that, filling in some of the gaps but layering it well. Sprinkle half the blue cheese. Then sprinkle hot sauce over that. 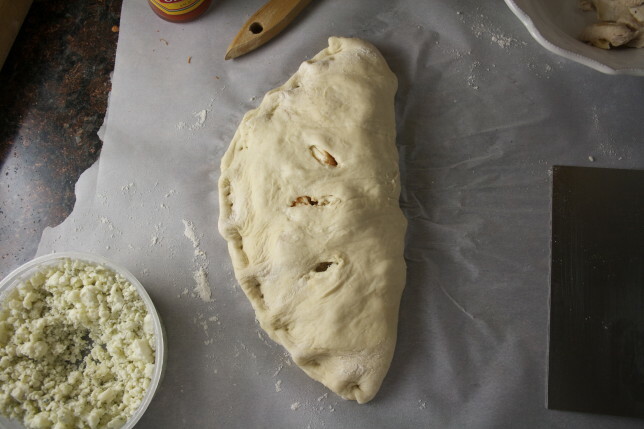 Using a pastry brush or your finger, brush the edge of the dough, all around the circle, with water. Gently lift the empty half of dough up off the parchment, using a bench scraper if necessary, and over onto the filled side of the circle. Press the dough to seal and crimp the edges. Cut three vents over the top and set aside while you repeat the process with the second ball of dough. Heat up one cup of water (I usually microwave it for 1 minute). 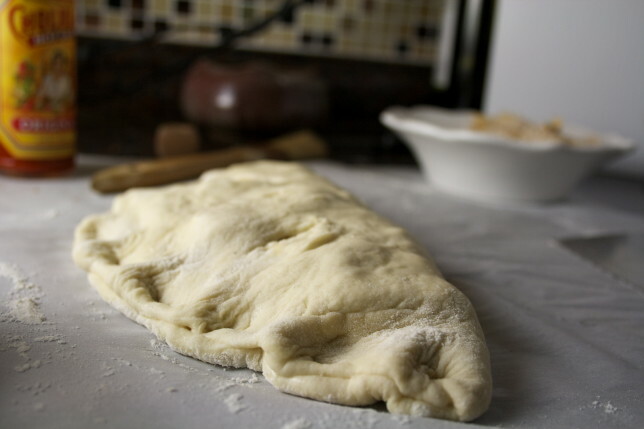 With the calzones still on the parchment (cutting the parchment around the calzone as necessary to fit), either place on a baking sheet and place in the oven or slide onto your baking stone. Quickly and carefully pour the hot water onto the broiler tray or baking pan on the rack beneath, and close the oven. 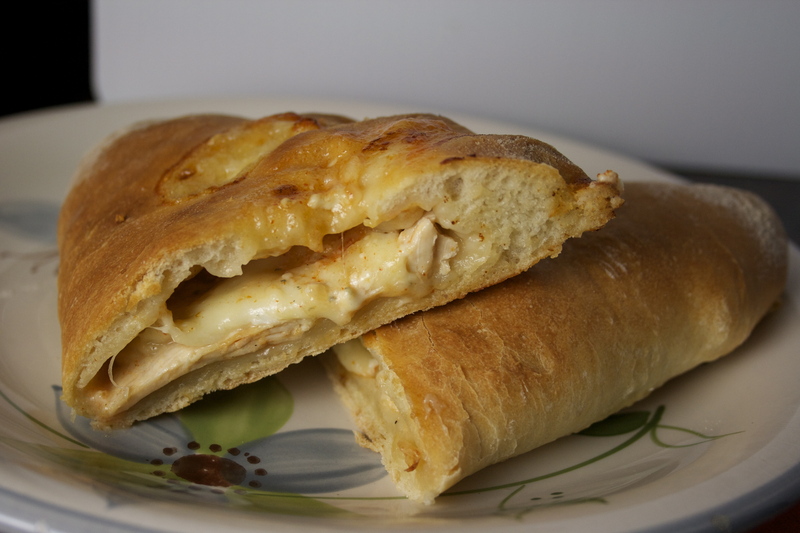 Bake the calzones for 20 minutes, or until they are golden and bubbling. Let them cool on a wire rack for a moment before cutting. Serve hot with ranch dressing.